At AllHires we take the security of your data seriously. 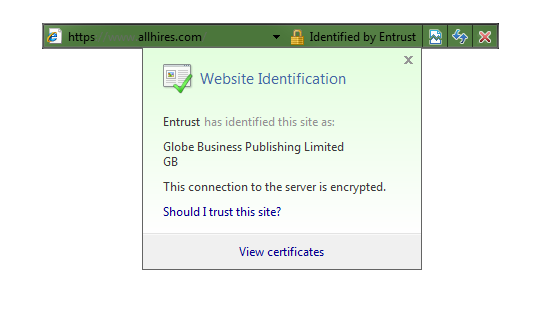 We have always encrypted all data between your browser and our website but, for your increased peace of mind, we now use an Extended Validation SSL Certificate (SSL-EV). The most noticeable effect of SSL-EV is that it turns the address bar green (Internet Explorer 7.0+, Mozilla Firefox 3.0+). This makes it much easier to verify that the information sent between you and our website is encrypted and should give you confidence that your data is secure. Please note that if you are using an older browser, such as Internet Explorer 6, the address bar will not be green and you should instead look out for the padlock. Your data is still secure but we recommend that you upgrade to a newer browser. AllHires is not responsible for the content of external links. Online Application System by © Copyright Globe Business Publishing Ltd 2003-2019.